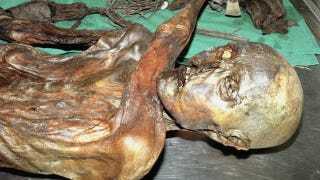 Ötzi the Iceman may have died 5200 years ago in the Italian Alps, but scientists are still divining the gustatory secrets of his last minutes. Before kicking the bucket, this Copper Age fellow had chowed down on some ibex. [The] Swiss team created new three-dimensional images of the ancient traveler's dentition. These showed that the Iceman suffered a blunt force trauma to two teeth-possibly a blow to the mouth-at least several days before his death and was plagued by both periodontal disease and cavities. The cavities, Seiler said in his talk, confirm that the Iceman ate a diet abounding in carbohydrates, such as bread or cereal, and reveal that he possessed a "heavy bacterial dose on these teeth." In non-culinary mummy news coming out of the conference, the Institute for Mummies and the Iceman has mapped the Iceman's entire genome — newsflash: he probably had brown eyes! If only we could all be so lucky to have entire futuristic research institutes devoted to the study of each of our frozen carcasses.